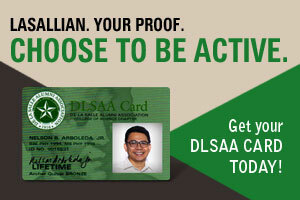 Home » DLSAA Chapters » What are the objectives of chapter formation? What are the objectives of chapter formation? To establish official links and initiate and promote interaction between and among all Lasallian schools in the Philippines in particular and all Christian Brothers' schools worldwide in general. To formally create, by law or otherwise, DLSAA organizations by college or regional location consistent with the DLSAA by-laws. To formally establish and maintain a chapter directory to enable stable channels of communication between DLSAA Manila and the chapter and/or its members. To enable the coordination of programs, projects, and activities nationally and internationally. What are the qualifications for a chapter? What are the kinds of chapters allowed? What are the basic responsibilities of a chapter?